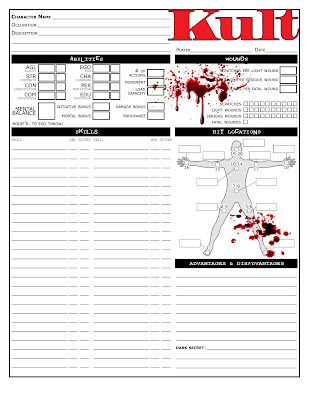 And finally, wrapping up this week's trio of terrifying treats, here's a character sheet for another of my favorite horror role-playing games: Kult. As much as I love classic/gothic and pulp horror, I also love contemporary dark fantasy/horror. I find myself inspired to new heights of imagination by such sources as the stories/novels/movies of Clive Barker, the stories/novels/comics of Neil Gaiman, and other sundry sources, such as DC's "Hellblazer" comic. (NOT the movie! Keanu Reeves as John Constantine? WTF?!) It's only natural, therefore, that a game like Kult should be attractive to me. 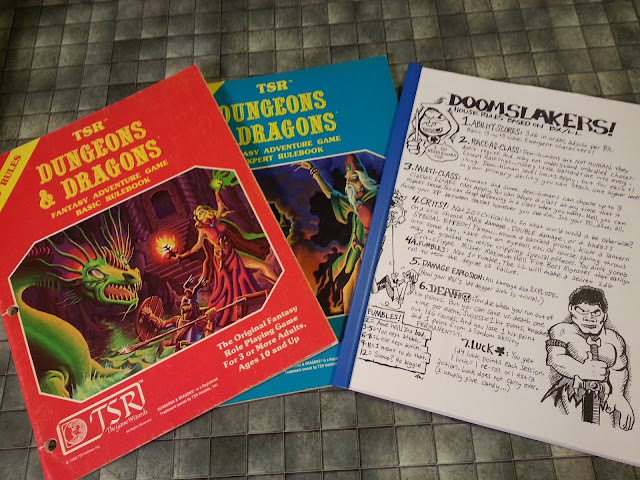 In fact, I preferred to use the system from R. Talsorian's Cyberpunk when I ran the game.Wow. We did this too. 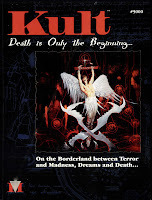 I ran Kult a handful of times back in the day. And every time we used Cyberpunk (though it was 2020 since that's what we had) for all the actual gameplay. So there's an interesting coincidence for you.